'In April 1912, it [the Daily Herald] resumed publication, and although its initial capital amounted to only £300 it enjoyed amazing success for the next two years. Its exact sales are not known, but estimates suggest its circulation ranged between 50 and 150,000. This was not as large as the two most popular dailies of the time, the Mail and Mirror, which sold between 750,000 and one million copies, but it was in the same league as the Express and Telegraph whose sales were 200,000-300,000 – especially since its sales were to manual workers who had not yet normally developed the habit of buying a daily as opposed to a Sunday paper. 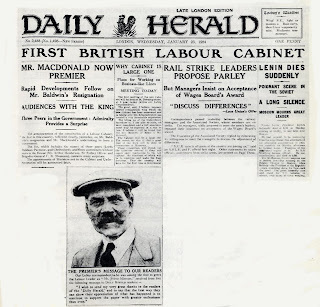 The Herald’s success is even more remarkable when it is noted that the official Labour Party leadership started a daily of their own in competition with it, the Daily Citizen, with much greater financial backing, in the summer of 1912. The new version of the Herald unashamedly used the latest techniques of popular newspaper production. So its third issue quite naturally had the banner headline, ‘TITANIC FLOUNDERS’. But the techniques of sensationalism were, as often as possible, turned against the existing system. And so day after day it asked questions on its front page as to the circumstances of the sinking – safety precautions in the ship, the conditions of its crew, above all why the male first-class passengers were allowed into the lifeboats while women and children steerage passengers were forced to remain on the sinking vessel. It was not till the 26th that the full story was known, and then, under the 'streamer': 'Women and Children Last!' the Daily Herald published a biting analysis. It pointed out the 121 steerage women and children were saved, 134 were drowned; 246 first and second class women and children were saved, and only twenty drowned; fifty-eight of the 173 first-class men passengers were saved. More than half the steerage children were drowned. The following biting words were printed: 'Where were those fifty-three steerage children, Mr Ismay, when you saved yourself?' The White Star Line's profits were pilloried as follows: 'They have paid 30 per cent to their shareholders and they have sacrificed 51 per cent of the steerage children. They have gone to sea criminally under-equipped with means of life-saving; they have neglected boat drill; they have filled their boat with cooks and valets, with pleasure gardens and luxurious lounges; they have done all this to get big profits and please the first-class passengers. 'Titanic Flounders' -- shurely shome mishtake. Ships 'founder'; people 'flounder around' in the water. So one can say that the Titanic foundered, whilst unfortunate passengers floundered around in the water. The most damning book review ever written?